These are a very tasty peanut butter cookie. We had bought a few bags of Peanut Butter M&amp;M's to add into some cookies. 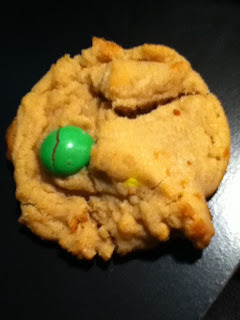 I found a peanut butter cookie recipe on Cooks.com and then added the bag of M&M's. So here is the recipe. Cream butter with sugars and peanut butter. Add eggs and vanilla. Add the flour and baking soda. fold in the M&M's. Bade at 350 degrees for 8 minute or until done. I am not sure how I missed that M and M's has peanut butters M&Ms but I see how they make these cookies, special. Thanks for linking this to My Meatless Mondays. I am writing from my other blog where you might want to link these goodies to Bake with Bizzy. These look so good! Love peanut butter in cookies! Thanks for sharing this recipe at Cast Party Wednesday. I hope to see you again next week. Mom kids would love them! I love the idea of the peanut butter M&M's with the cookie. Sounds delicious! Thanks for sharing on Sweet Indulgences Sunday. Yummy! I just love all that Peanut Butter, this is a great recipe for a very special treat. Hope you are having a great week end and thank you so much for sharing with Full Plate Thursday. What? So awesome! Thanks for linking up to Fat Camp Friday. Hope you enjoyed your weekend, see you next time! I never thought using PB M&M's in PB cookies....great idea. My kids will go nuts over these. Thank you for sharing it at Foodie Wednesday. Hope to see you there today with another great recipe. Yummy! Just wanted to let you know that I nominated your cute blog for the Versatile Blog Award! !